The Agilent 70703A oscilloscope was designed for use in ATE systems. 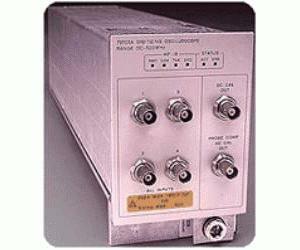 In repetitive measurements, it provides 500 MHz of bandwidth. A 20 mega-sample-per-second sampling rate allows single-shot measurements to 2 MHz. Dual-time-base windowing allows for closer inspection of pulse edges. Automatic measurements, autoscale, and waveform math make for very fast test development and execution. A wide range of vertical sensitivity (1 mV/div to 5 V/div), a full function attenuator, and 8-bit vertical resolution provide ample amplitude freedom. All inputs can be switched between 1 M ohms and 50 ohms, and ac or dc coupling. Any two channels can sample simultaneously. Four non-volatile waveform memories can store digitized channel data or data downloaded from a controller. Two independent functions can operate on digitized channels or stored waveforms. The operators available for these functions are plus, minus, times, versus, invert, and only.